On 7 December 1941, Japanese forces attacked the United States Pacific Fleet at Pearl Harbor, Hawaii. The attack damage much of the U.S. battleship fleet and started a war between the two nations. The initial goals of Japanese leaders were to destroy the US Navy, seize lands rich in natural resources, and establish strategic military bases to defend Japan's empire in the Pacific Ocean and Asia. To do this, Japanese forces captured the Philippines, Thailand, Malaya, Singapore, Burma, the Dutch East Indies, Wake Island, Gilbert Islands, New Britain and Guam. Joining the U.S. in the war against Japan were the rest of the Allied powers, several of whom, including the United Kingdom, Australia and the Netherlands had also been attacked by Japan. 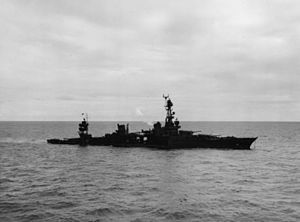 Two attempts by the Japanese to take islands in the south and central Pacific so they could threaten Australia and Hawaii or the US West Coast were stopped at the naval battles of Coral Sea and Midway. Coral Sea caused losses for both sides, but in some ways it was an Allied victory. 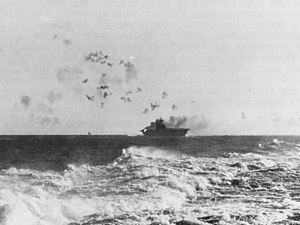 Midway gave the Allies' their first clear major victory against the Japanese. It also reduced Japan's carrier forces. But did not change their plans for continuing attacks for several months. The Japanese made mistakes making risky attacks, like the attempt to assault Port Moresby over the Kokoda Trail. Up to this point, the Allies had been having to defend themselves in the Pacific. These victories started the Allies to be moving towards winning in the Pacific. The Allies chose the southern Solomon Islands of Guadalcanal, Tulagi and Florida Island, as the first target. The Imperial Japanese Navy (IJN) had occupied Tulagi in May 1942 and had constructed a seaplane base nearby. Allied concern grew when, in early July 1942, the IJN began constructing a large airfield at Lunga Point on Guadalcanal. From such a base Japanese long range bombers would threaten the West Coast of the Americas and the East Coast of Australia. By August 1942, the Japanese had about 900 naval troops on Tulagi and nearby islands and 2,800 people on Guadalcanal. These bases would protect Japan's major base at Rabaul, threaten Allied supply and communication lines and establish base for attacks against Fiji, New Caledonia and Samoa (Operation FS). The Guadalcanal attack would be carried out in at the same time as an Allied offensive in New Guinea under Douglas MacArthur. The goal was to capture the Admiralty Islands and the Bismarck Archipelago, including the major Japanese base at Rabaul. The goal was the American capture of the Philippines. 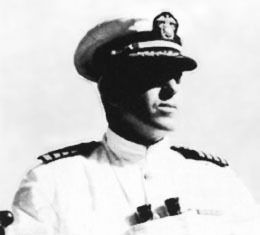 The U.S. Joint Chiefs of Staff put Vice Admiral Robert L. Ghormley in command on 19 June 1942, to direct the attack in the Solomons. At first, the Allied attacks were planned just for Tulagi and the Santa Cruz Islands, and not Guadalcanal. After Allied planes discovered the Japanese airfield on Guadalcanal, its capture was added to the plan and the Santa Cruz operation was dropped. The Japanese were aware of the movement of Allied forces in the South Pacific area. They thought that the Allies were reinforcing Australia and perhaps Port Moresby in New Guinea. Bad weather allowed the Allied force to arrive near Guadalcanal unseen by the Japanese on the night of 6 August and the morning of 7 August and take the defenders by surprise. This has sometimes called the Midnight Raid on Guadalcanal. The landing force split into two groups, with one group attacking Guadalcanal, and the other Tulagi, Florida, and nearby islands. 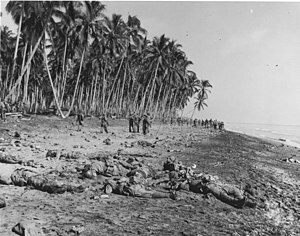 In contrast to Tulagi, Gavutu, and Tanambogo, the landings on Guadalcanal had much less resistance. At 09:10 on 7 August, Vandegrift and 11,000 U.S. Marines came ashore on Guadalcanal between Koli Point and Lunga Point. Advancing towards Lunga Point, they had no resistance. They stopped for the night about 1,000 yards (910 m) from the Lunga Point airfield. The next day, against little resistance, the Marines advanced to Lunga River and captured the airfield by 16:00 on 8 August. Throughout August, small numbers of U.S. aircraft and their crews continued to arrive at Guadalcanal. By the end of August, 64 aircraft of various types were stationed at Henderson Field. On 3 September, the commander of 1st Marine Aircraft Wing, U.S. Marine Brigadier General Roy S. Geiger, arrived with his staff and took command of all air operations at Henderson Field. Air battles between the Allied aircraft at Henderson and Japanese bombers and fighters from Rabaul continued almost daily. Between 26 August and 5 September, the U.S. lost about 15 aircraft while the Japanese lost approximately 19 aircraft. More than half of the downed U.S. aircrews were rescued while most of the Japanese aircrews were never recovered. The eight-hour round trip flight from Rabaul to Guadalcanal, about 1,120 miles (1,800 km) total, made it hard for the Japanese to attack Henderson Field. Australians on Bougainville and New Georgia islands were often able to provide Allied forces on Guadalcanal with warnings of Japanese air strikes, allowing the U.S. fighters time to take off and attack the Japanese bombers and fighters as they approached the island. Vandegrift continued to strengthen and improve the defenses of the Lunga perimeter. Between 21 August and 3 September, he sent three Marine battalions, including the 1st Raider Battalion, under Merritt A. Edson (Edson's Raiders), and the 1st Parachute Battalion from Tulagi and Gavutu to Guadalcanal. These units added about 1,500 troops to Vandegrift's original 11,000 men defending Henderson Field. The 1st Parachute Battalion, which had many dead and wounded in the Battle of Tulagi and Gavutu-Tanambogo in August, was placed under Edson's command. The other relocated battalion, the 1st Battalion, 5th Marine Regiment (1/5), was landed west of the Matanikau near Kokumbuna village on 27 August. They had the mission of attacking Japanese units in the area. In this case, however, the Marines faced hot sun, and strong Japanese defenses. The next morning, the Marines found that the Japanese defenders had departed during the night, so the Marines returned to the Lunga perimeter by boat. 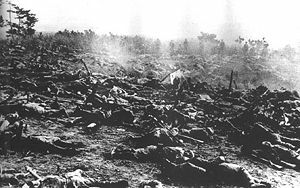 Losses in this action were 20 Japanese and 3 Marines killed. ↑ Jersey, p. 356–358. 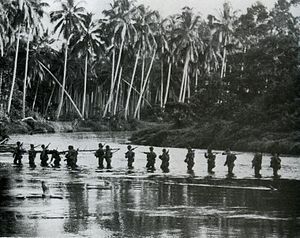 Assisting the Americans in the latter stages of campaign were Fijiian commandos led by officers and non-commissioned officer from the New Zealand Expeditionary Force. ↑ Frank, p. 57, 619–621; and Rottman, p. 64. 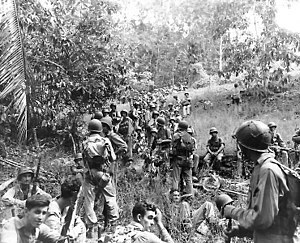 Approximately 20,000 U.S. Marines and 40,000 U.S. Army troops were deployed on Guadalcanal at different times during the campaign. ↑ Rottman, p. 65. 31,400 men Imperial Japanese Army and 4,800 men Imperial Japanese Navy troops were deployed to Guadalcanal during the campaign. Jersey claims that 50,000 total Japanese army and navy troops were sent to Guadalcanal and that most of the original naval garrison of 1,000–2,000 men was successfully evacuated in November and December 1942 by Tokyo Express warships (Jersey, p. 348–350). ↑ Frank, p. 598–618; and Lundstrom, p. 456. 85 Australians were killed in the Battle of Savo Island. Total Solomon Islander deaths are unknown. Most of the rest, if not all, of those killed were American. Numbers include personnel killed by all causes including combat, disease, and accidents. Losses include 1,768 dead (ground), 4,911 dead (naval), and 420 dead (aircrew). Four U.S. aircrew were captured by the Japanese during the Battle of the Santa Cruz Islands and survived their captivity. An unknown number of other U.S. ground, naval, and aircrew personnel were, according to Japanese records, captured by Japanese forces during the campaign but did not survive their captivity and the dates and manners of most of their deaths are unknown (Jersey, p. 346, 449). Captured Japanese documents revealed that two captured Marine scouts had been tied to trees and then vivisected while still alive and conscious by an army surgeon as a medical demonstration (Clemens, p. 295). Ships sunk includes both warships and "large" auxiliaries. Aircraft destroyed includes both combat and operational losses. ↑ Frank, p. 598–618, Shaw, p. 52, and Rottman, p. 65. Numbers include personnel killed by all causes including combat, disease, and accidents. Losses include 24,600–25,600 dead (ground), 3,543 dead (naval), and 2,300 dead (aircrew). Approximately 9,000 died from disease. Most of the captured personnel were Korean slave laborers assigned to Japanese naval construction units. Ships sunk includes warships and "large" auxiliaries. Aircraft destroyed includes both combat and operational losses. ↑ Bowen, James. Despite Pearl Harbor, America adopts a 'Germany First' strategy. The Pacific War from Pearl Harbor to Guadalcanal. Pacific War Historical Society. http://www.pacificwar.org.au/GermanyFirst/GermanyFirst.html. Retrieved 30 December 2007. ↑ 143.0 143.1 Murray, p. 215, Hough, p. 372. ↑ 144.0 144.1 Hough, p. 372, Miller, p. 350, Zimmerman, p. 166. ↑ Willmott, H. P; Robin Cross, Charles Messenger (2006) . "American Offensives in the Pacific". In Dennis Cowe. World War II. London: Dorling Kindersley. pp. g. 208. ISBN 1-4053-1262-9 .;Miller, p. 350, Shaw, p. 52, Alexander, p. 81. Anderson, Charles R. (1993). "Guadalcanal" (brochure). U.S. Government Printing Office. http://www.army.mil/cmh-pg/brochures/72-8/72-8.htm. Retrieved 2006-07-09. Cagney, James. "An Animated Map History of the Battle for Guadalcanal". HistoryAnimated.com. 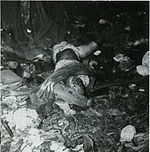 http://www.historyanimated.com/Guadalcanal.html. Retrieved September 4, 2008. This page was last changed on 24 November 2014, at 04:12.